Please note: We do NOT ship strawberries. They are available for local pickup only at our Schenectady Main Store or our Newton Plaza Shop in Latham, NY. 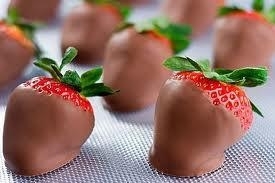 Our Chocolate Dipped Strawberries are dipped fresh daily in both locations. To ensure that we have exactly what you need when you need it, including other chocolate-dipped fresh fruits, please order online or call ahead for local pickup only at least 24 hours in advance. Or order online at least 24 hours in advance. Please be sure to indicate your pickup location and date in your order. Strawberries vary in size, depending on the seasonal crop. You can expect to get 12-15 per pound. If you need a specific number of berries, please call us and we will adjust your order accordingly! We always use either locally grown (in the summer) or domestically grown throughout the rest of the year. We specialize in this item and sell several thousands of lbs. of them each year. We offer them year round but we find that in the autumn (September-early November) the crop is spotty so we do not dip them every day. Please call for availability. Note: White and sugar-free chocolate-dipped fruit must be pre-ordered. We do not carry these on a regular basis. Please make your selection from the drop-down menu when you order. Looking for something extra-special? Please see our Our Chocolate Dipped Strawberry Filled Hearts! Sugar-Free Chocolate Covered Jells Chocolate Dipped Graham Crackers Chocolate Truffles - 2lb Box Box of Assorted Chocolate "Sampler"